A few years ago, the movie world was saturated with drama-comedies of twentysomethings trying to find themselves and their path in the "real world". With LARRY CROWNE, I spy a new trend of movies where fortysomethings try to find themselves amidst a midlife crisis in a bad economy. Not saying either is good or bad because each speak to the times at hand. However, if LARRY CROWNE is the model of the fortysomething-movie, God help us all. This movie is awful. Absolutely awful. It's a waste of time, energy, and acting resources. Tom Hanks, who wrote, starred and directed this movie, secured some damn fine actors (two of which are Academy award winners and one nominee) and completely wastes all of their talent, including his own. The story had potential for such weight and caliber, but it comes of flighty and boring. 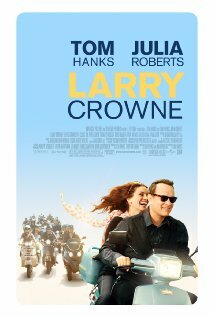 Hanks stars as Larry Crowne, a former cook for the navy who now works at the movie equivalent of Wal-Mart. Everyone who works with him loves him, and initially, he comes off somewhat of an endearing duface. The tone shifts, and he gets let go because the company is raising their standards, and he doesn't have a college degree, so he decides to go back to college. Oh, and within the past couple years, he just went through a divorce because in these types of movies, when it rains, it pours. Then we're introduced to his Speech teacher, Mercy (Roberts), as an alcoholic, married to a loser husband, semi-deadbeat teacher who use to love what she did but doesn't anymore. Why? Never fully explained. I guess we can assume that teaching use to give her joy because she felt that it made a difference with her students, but now it doesn't. Her arc is very cliche and a snooze-fest. Larry is in her class, which only has ten students, and that dynamic had the possibility to create a fun almost Community-esque feel within the interactions, but unfortunately we're left with stereotypes such as the pretty jock, Star Trek nerd, and douchey yet lovable frat boy. Everyone is a one-note, drab character, and I would have dropped that class day one. So you would think that the growing relationship between teacher and student would be the focus of the movie, but you would be incorrect. A bulk of the movie focuses on Crowne's newfound friendship by free-spirited, Scooter driving, vintage (aka Urban Outfitters) wearing Talia. She's fun, quirky, and rocks an awesome SideKick phone. She's also the cliche hipster that has mix-matched colorful clothes that don't match her Scooter because she's super trendy. Even though she is representing this modern trend of new age free spirits, she comes off as annoying and vapid. She notices Crowne driving a Scooter, and presto...instant friendship. She almost makes him realize he's going through a midlife crisis and pretty much forces herself into his life. She changes his decor in his house, his clothes, and invites him to run with her Scooter gang, which rides around with the intention of enjoying the open roads like motorcycle gangs do, but their saccharine and trendy ideals make me want to punch them in the face. (I have no doubt that Scooter sales will increase because it will be the new and cool thing to do.) As Crowne and Talia's relationship grows, it ends up being less endearing and more insanely creepy to the point to almost pedophilia. I don't understand it. Don't get me wrong, I really do like Tom Hanks and Julia Roberts as actors. However, this movie proves that just because you're really famous and talented doesn't mean you have chemistry with each other. Hanks and Roberts end up with an attraction towards each other. Why? I have no idea because he seems really safe and boring, and in class, which has been their only interaction, she comes off as a disheartened and cold. Anyways, when they end up sharing their first kiss, I felt as if I was watching a brother and sister kissing. It was awkward and uncomfortable. LARRY CROWNE falls into the category of so much wasted potential. The ideas behind the movie could have lent itself to real insight about the problems many Baby Boomers face today. However no deep level of intellect is ever achieved. Hanks and Roberts have never been worse. Don't waste your time.